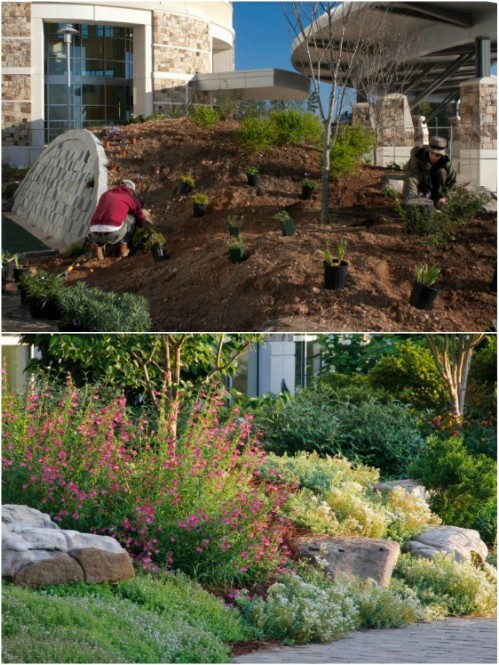 When planning out your gardens this year, did you give any thought to a rock garden? I have loved rock gardens since I was a kid…remember those cute rock families? Those really got me into rock gardening and I have built quite a few in different yards over the years. The thing with rock garden is that they are super easy to build and even easier to maintain. You just need a few rocks, a plan and some plants to fill in the blanks. So, on that note, I have a great little list of 10 gorgeous and easy to DIY rock gardens that you are going to definitely want to add to your outdoors this season. From painted bugs to cactus, you will find everything you need to fit your DIY rock garden to your own style. Even if you have a really small backyard or front yard, you can build a gorgeous rock garden to give it character. And if you do have a backyard that has little space, be sure to check out some of these 15 small backyard decorating ideas. You will find some way to fill in those tiny spaces with décor, and have plenty of room for all of your outdoor necessities. Gardening is honestly one of my favorite things to do and rock gardening is so easy. You just have to plan out where you want your rock garden to go and then get to work. Some of these can be done in just an hour or so, depending on how expansive you want them to be. 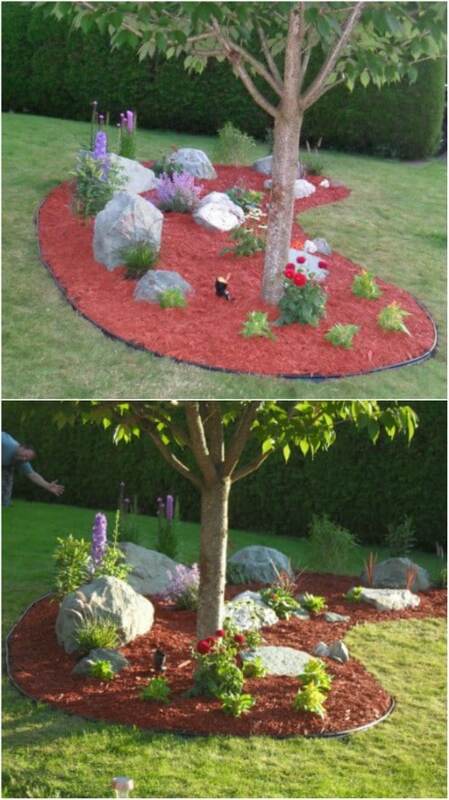 You could even build a DIY rock garden by simply placing rocks strategically throughout an existing flower bed. Just take a look at these and start planning out your rock garden for this season. And, be sure to also take a look at these 24 DIY storage solutions for your outdoors. They’ll give you plenty of room to build that DIY rock garden! I love cacti! They are so easy to grow and they look so gorgeous. You can incorporate your own love of the cactus into this simple DIY cactus rock garden. You just designate a space for your garden and then fill it with rocks. 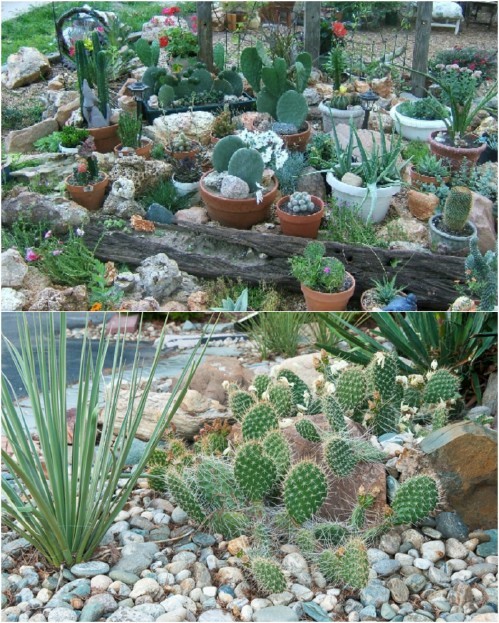 Your cactus will grow beautifully within the rock garden and give it a splash of color. You can do this with smaller succulents, too if you want. It’s a quick and easy way to DIY your rock garden. Bonus grab or diy these painted rock cactuses to decorate your garden. 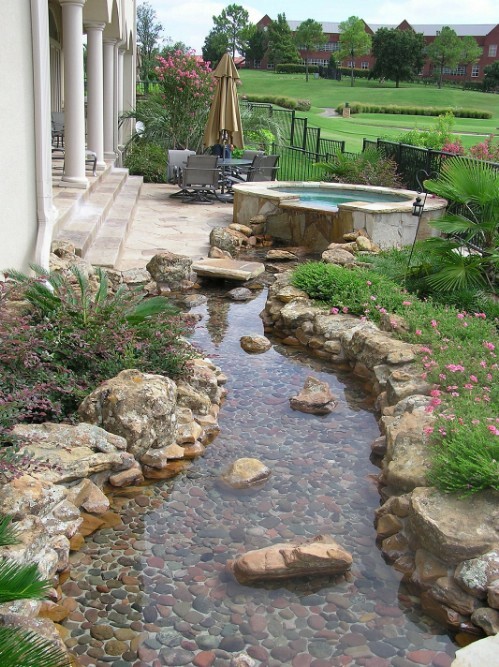 If you love the idea of a rock garden and you love the idea of a small creek in the yard, you can incorporate those two ideas into a gorgeous DIY rock water garden. You will need to mark off the space where you want to build your water feature and then just add your rocks. This would be a great idea to pair with a DIY water fountain or feature and it’s a fairly easy build. DIY water gardens add so much style to your outdoors. 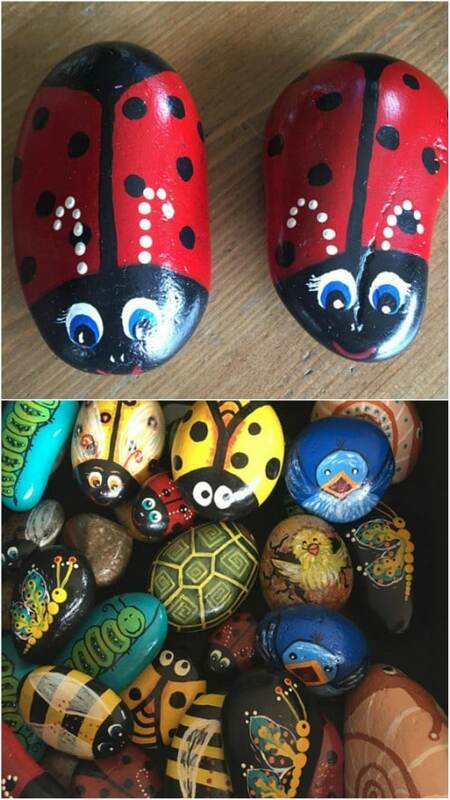 Turn your ordinary lawn space into an adorable little bugfest with these painted bug rocks. I found these on Etsy and they’re just $4 each. Or, if you prefer to completely DIY a rock garden, you can paint your own little rock bugs. You just need a few rocks, preferable slick ones, and some paints in various colors. Stick to one bug, like a ladybug, or create an entire bug army from different species. A rock garden can be any size that you want and it can have rocks of any size that you want. 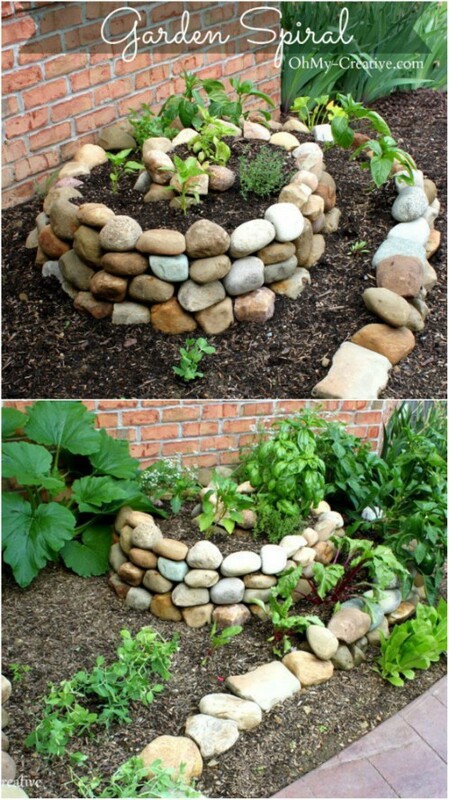 This is a great DIY rock garden if you have a lot of huge boulder sized rocks in your yard. Instead of trying to move those rocks, just build a little garden around them. 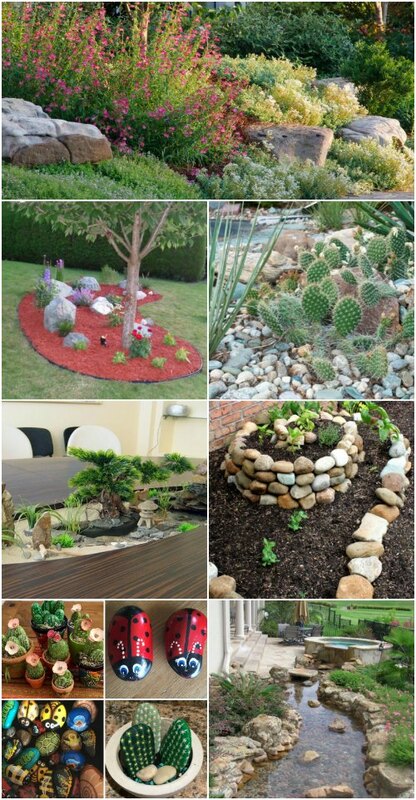 You could also add to your rock garden if you have a few smaller rocks and stones that you want to use. If you have the time, and the space, you can turn a piece of your yard into a professionally landscaped rock garden, and you don’t have to pay professional prices to do it. You just designate a space, mark it off and then remove the sod. Once you have the grass removed, you can add your rocks and plants. This is a great idea for the edge of your front lawn. It instantly draws the eye to the garden and is a great way to improve your curb appeal. If you have a small front or backyard, you want a small rock garden. Your rock garden shouldn’t overwhelm the yard but instead, it should complement it and add a nice little focal point. There are some amazing ways that you can use a small rock garden to accent a smaller yard. You just start with a designated space and then build it from there. You could even incorporate your rock garden into an existing flowerbed or build it right next to your house for more space. You can even enlist the help of your young ones with building a rock garden. Kids love to paint and in my experience, they love rocks, so this is a great DIY kids gardening project for the spring. 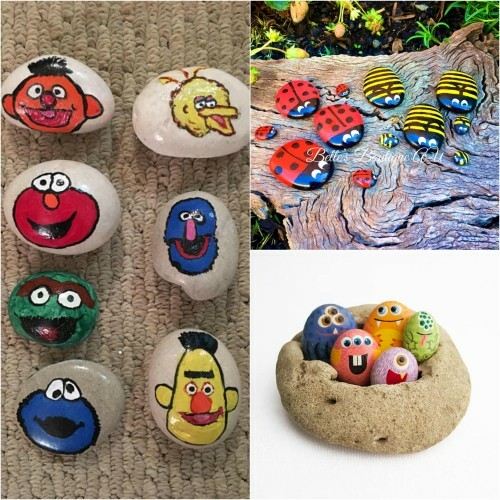 Just grab some rocks and give your little ones some paints or markers so that they can create plants, bugs or anything else that they want to add to your new garden area. This DIY spiral rock garden is perfect for smaller spaces. It is super easy to build and it gives your yard such a lovely focal point. Once you have the rocks in place, you can add plants to give your rock garden a bit of color. You could even do these to plant your vegetables or them make wonderful strawberry gardens. You’ll need quite a few rocks for this one and a weekend or so to get them all in place. This DIY rock garden is so simple to build and you end up with lovely plants in the crevices between your rocks. You can build this one as big or as small as you want, the process is the same no matter how many rocks and plants you add to it. This is a great one for the front yard, to give you a bit more curb appeal and can be done in an afternoon if you aren’t planning to cover the entire yard in rocks and plants. 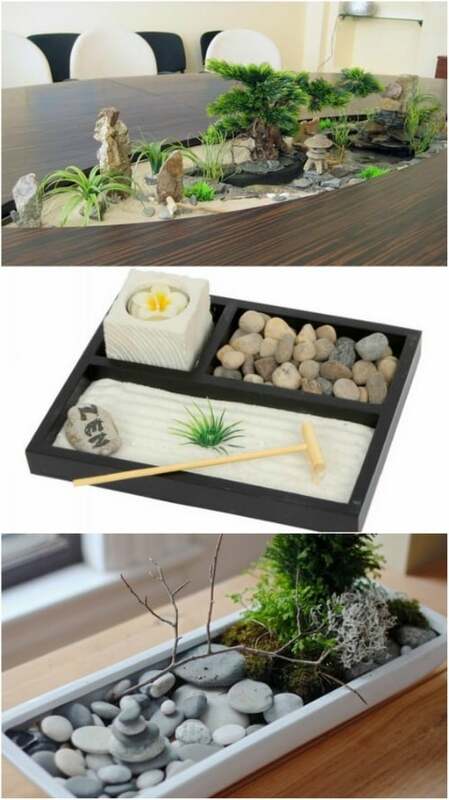 I love DIY Zen gardens! They are so relaxing and gorgeous, and this DIY tabletop rock garden is no different. This is so easy to make and it is perfect if you want a lovely little rock garden indoors or outside on your patio table. This is great if you really don’t have the space to build a rock garden in your yard or if you just don’t want to have to mow around those rocks during the warmer months.